Time to kick on says Posh chairman Darragh MacAnthony. 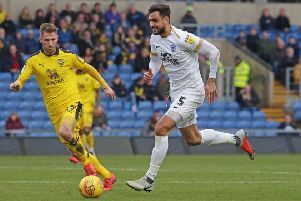 Peterborough United chairman Darragh MacAnthony joined a Peterborough Telegraph Twitter commentary. We asked followers of @PTAlanSwann on Twitter their thoughts on the opening 10 Posh games of the League One season. Ian Gow says Posh can't defende or score goals! And MacAnthony - Twitter name @DMAXC102 - was among those who replied. Guess question would be, Bar Bradford game, did we play well enough/create chances to win all other nine games? Average start, time to kick on! Average start, but 36 games to go, four points off the play-offs, get a series of wins together and we’ll be fine. Stuart Cave believes Posh have a squad capable of winning promotion. The start is what I expected as my expectations were low. We will finish mid-table. Underachiveing start I feel, played some good football which encourages me going forward, need to grow a pair, show less respect! Mid-table unless we get a striker who can actually score. There have been positive signs and I’m optimistic. I’m not going to join the hundreds asking for a new striker as I believe we have a squad capable of promotion! It’s been a promising-ish start, turn three of the draws into wins and it looks very different. We will be there or thereabouts for the play-offs. Not good enough in front of goal and still too shaky at the back so need to fix both or mid-table mediocrity looms. A bang average start in a poor league. Play-offs are a possibility, but we must be more ruthless in both boxes. Can’t defend, can’t score goals. Relying on a player who’s out until November and was average last season. Decent football, but shame we can’t defend. We would be top of the league if we converted our chances. I didn’t have much expectation at the start, but gutted we’ve thrown away games We’ll probably finish about 10th unless we can find a striker. Okay football, but not seen anything too impressive. Awful tactics/personnel choices.